At what age should a first orthodontic evaluation be done? 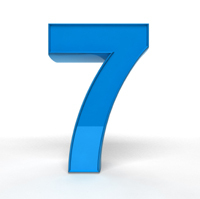 Why should an evaluation be done at 7 years of age? The Canadian Association of Orthodontists (CAO) and the American Association of Orthodontists (AAO) recommend a first orthodontic evaluation as early as 7 years of age for all children. The permanent first molars erupt at around 6-7 years of age and they make it possible to establish the posterior occlusion. At this moment, it is already possible to evaluate the relationship between the teeth and the jaws in all 3 dimensions (front-back, width and height) and detect several dental and skeletal problems, as well as functional deviations of the lower jaw. The incisors have begun their eruption and certain problems, such as crowding, dental rotations, closed occlusion (too much overbite between the teeth), an anterior open bite, certain habits and facial asymmetries, can be identified. Should an intervention be done? An early evaluation does not imply that an intervention is necessary at an early age. For certain people, a timely evaluation may lead to significant improvements if an orthodontic intervention is indicated while for others, the immediate benefit of an early evaluation will be the parents’ peace of mind. Several intervention and interception procedures can be initiated at an early age, which can make it possible to minimize the severity of developing problems. The most severe problems are the only ones for which an orthodontic intervention at an early age will be indicated. To preserve or recuperate the space necessary for the eruption of permanent teeth. An orthodontic evaluation performed at an early age will probably not avoid the necessity for another intervention later, but it may lead to a simpler and more efficient treatment for patients, as well as reassuring them on their dental condition. The dentist who refers his/her young patients at the right time is perceived by parents, with reason, as a well-informed practitioner having his/her patients’ well-being at heart. 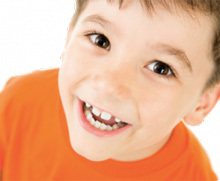 Do not hesitate to ask your general dentist to refer your child to an orthodontist for a first evaluation. Correction of an anterior or posterior crossbite. Do I need a dentist’s reference to get an orthodontic consultation? NO! Although most people are referred to us by their general dentist, because they often detect problems first, it is not necessary to be directed or “referred” by another health care professional and one can communicate directly with an orthodontist to make a consultation appointment in orthodontics. The general dentist plays an important role in the detection of dental and occlusal problems in children, because he/she sees them often at an early age and can follow the evolution of the dentition throughout their first years. Thus, when he/she detects problems associated with eruption, lack of space, jaw discrepancies or any other anomaly associated with occlusion, he/she can refer the young patient for an orthodontic evaluation. Even if no problems seem visible at first sight during a visual examination of your 7-8-year-old child’s dentition, ask your general dentist to refer you to an orthodontist for a first evaluation. 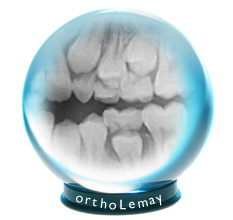 Taking a panoramic radiograph at around this age can reveal a lot on your child’s “dental future” and developing occlusion. At what age do teeth erupt and in which sequence? To learn about the average age at which teeth erupt and their sequence of eruption, consult this section.